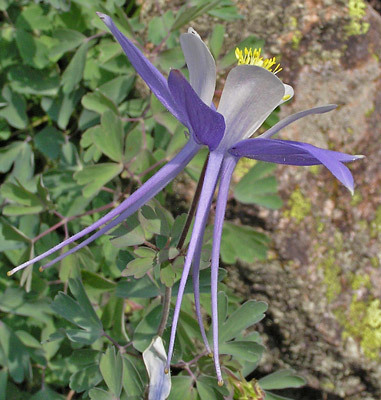 Aquilegia species hybridize and are, in the words of the Flora of North America, "difficult to define adequately. Some of the variability is because of introgressive hybridization. 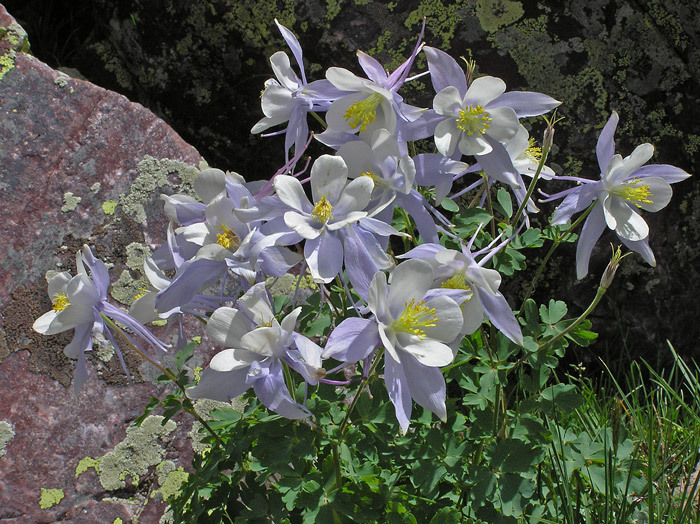 Even distantly related species of Columbine are often freely interfertile, and many cases of natural hybridization and introgression are known from North America." 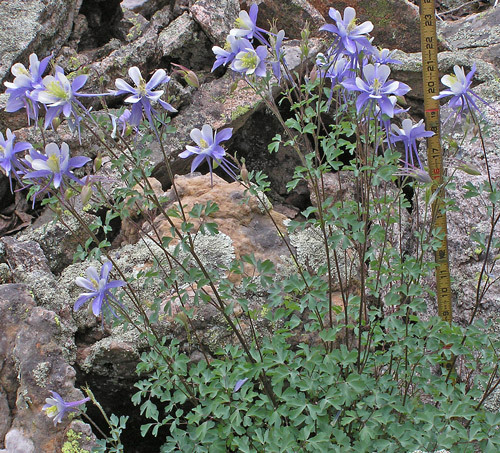 This page and linked ones shows Aquilegia coerulea, which occurs throughout the Four Corners area and which does occasionally hybridize with Aquilegia elegantula (Shooting Star Columbine). The resulting hybrid shows interesting characteristics of both plants. 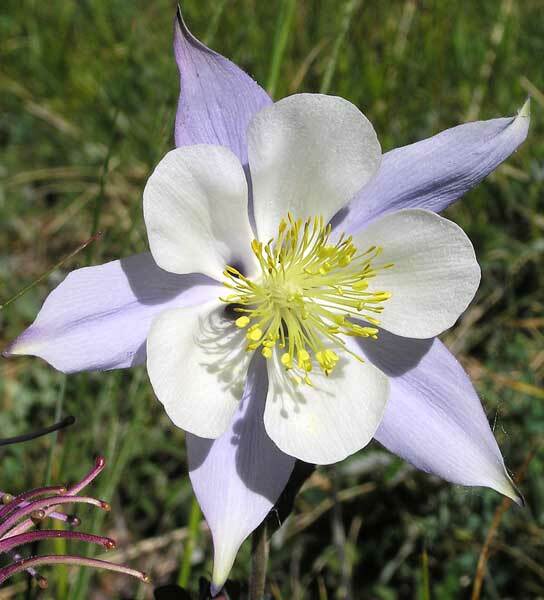 1) Almost all sources, including botanical Latin expert William Stearn, indicate that the word "Aquilegia" is derived from the Latin "Aquila" ("Eagle"). 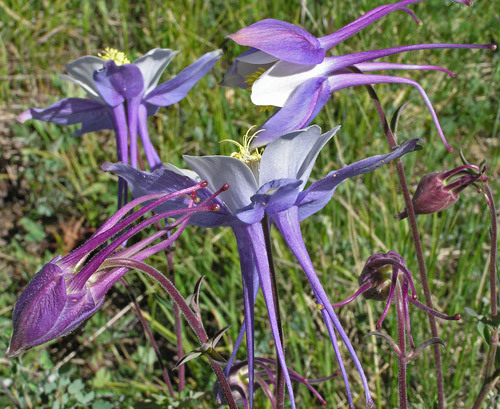 "Aquilegia" would then refer to the talons of an Eagle and their similarity to the spurs of the flower. William Weber, however, indicates that the word is derived from "aqua" ("water") and "legere" ("to collect") referring to the "nectar at the base of the spur". 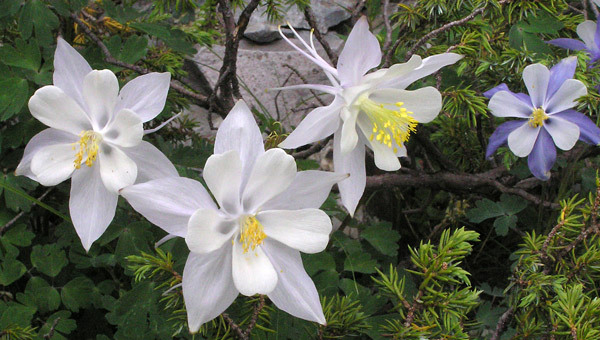 2) "Columbine", Latin ("columbinus") for "Dove", refers to the flower's resemblance (from the rear or side of the flower) to a group of Doves. Alpine, subalpine, montane. Meadows, woodlands, rocks, scree. Summer. Above: Pass Creek Trail, July 14, 2016 and Kennebec Pass, June 29, 2018. Left: Navajo Lake Trail, July 6, 2004. 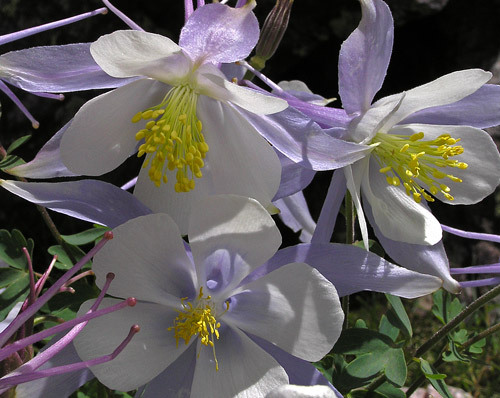 This exotic Columbine is the state flower of Colorado. 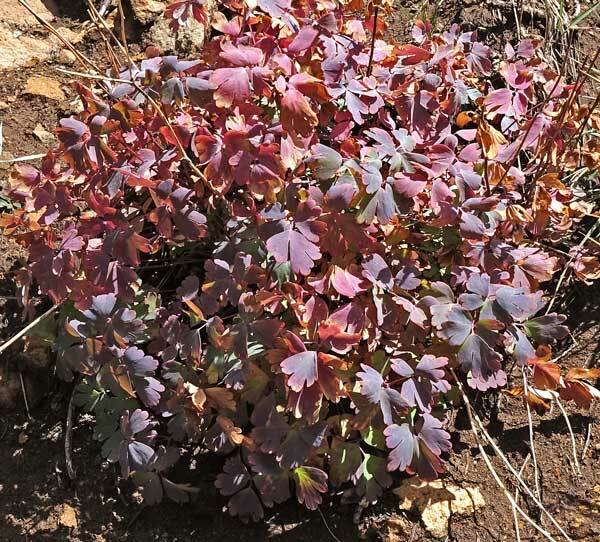 It has a broad habitat range, thriving on hot, dry, talus slopes and in moist, shady forests; its color varies through a wonderful range of whites, blues, and purples; and its flowers thrive from June through August. The five petals have unusual and showy spurs; the five sepals are usually larger than the petals. Edwin James discovered this plant for science when he was on the 1820 Long Expedition in Colorado. He named and described the plant in 1823. The spelling of the specific epithet is variable; some botanists spell it "caerulea", most "coerulea". The reason for the two spellings is almost certainly James' mistake: on the holotype specimen he spelled it "coerulea", but on some other specimens he collected, he spelled it "caerulea". 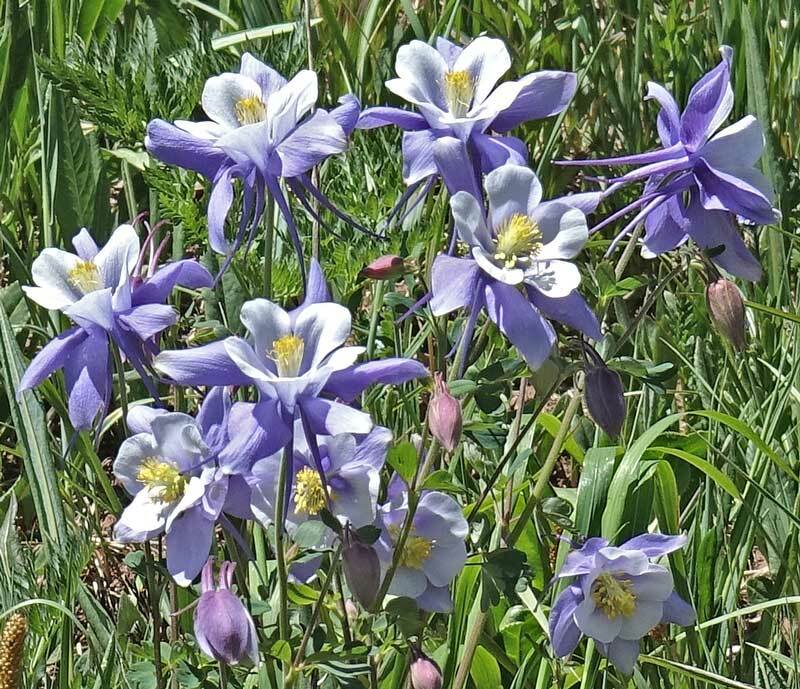 A later side note on misspellings is the 1899 Colorado state law which made the plant the state flower of Colorado. 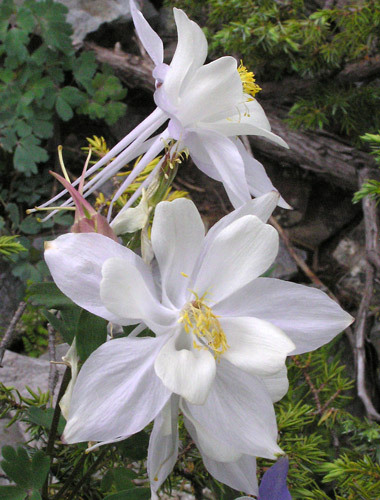 In the law the name was written "Aquilegia, Caerulea". Notice the incorrect use of a comma between the genus and specific epithet and also notice that the specific epithet is incorrectly capitalized. Obviously the state needs not only a state flower but also a state botanist. Fast forward to the Internet age and the 1899 mistake was compounded on the Colorado state web site which lists the state flower, bird, song, etc. 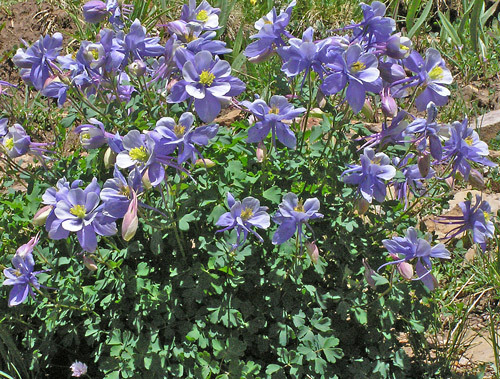 There the flower name was spelled "Aquilegia caerules". 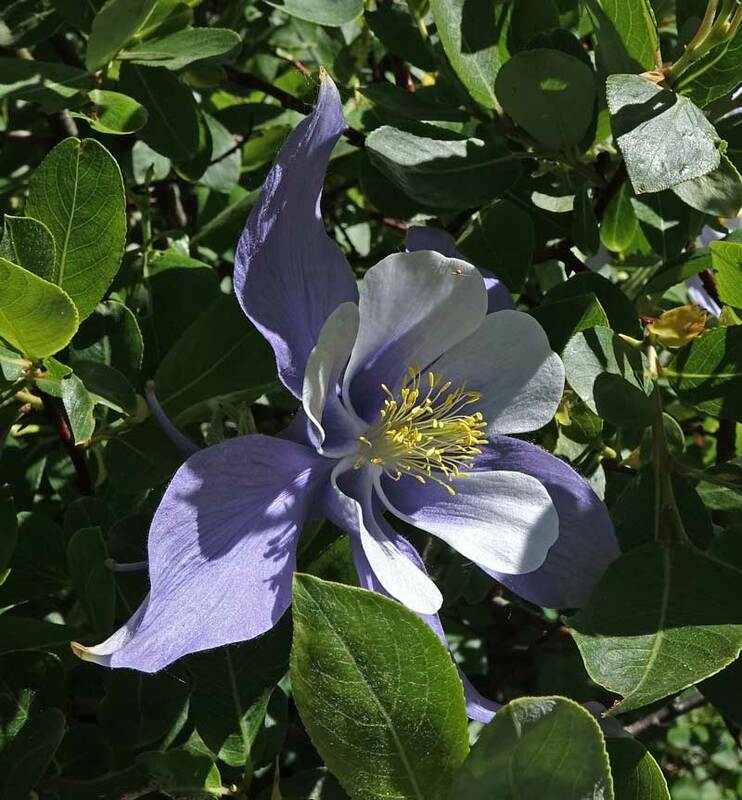 Needless to say, with my drive toward getting things right, I called the Colorado State Archivist and the spelling of the name of the Colorado state flower has been corrected on the state web site. That's one small mistake corrected for mankind. Six trillion mistakes left. Do your part. "Coerule" is Latin for "blue". Navajo Lake Trail, July 6, 2004. Sharkstooth Trail, August 27, 2018. Fall leaf color is subtle combinations of maroons, reds, pinks, and greens. West Mancos Trail, June 26, 2004. Below Snowdon Peak, August 1, 2005. Lake Hope Trail, July 15, 2008.